Notice I said “use framed art in front of a fireplace’ and not ‘use framed art as a fireplace screen.’ This is ONLY for cases when there is NO FIRE in the fireplace. This art is highly flammable, and needs to be moved if the fireplace is in use or hot. Okay, so if your artwork catches on fire, don’t call me, hee, hee. Seriously people, be safe!! So I had an old gold frame I wasn’t using, it was a 30×40 inch frame. Previously I painted it (HERE) and put it in front of the fireplace. Then I thought, what if there was something really interesting in the frame? But I didn’t want anything too busy or with too much color. I thought it would look weird. Yes, a monochromatic print on the floor in front of the fireplace is not weird, but a painting with lots of color is. Well, what I really mean is that something with lots of bold color wouldn’t work in this room, but in a room full of color, it might be really nice. This is actually a map of Paris from 1715. Well it’s not the original, of course. I had the map mounted on foam board, so it wouldn’t need glass. If you have artwork on the floor, I don’t recommend having glass in the frame, because it is much more susceptible to breakage. For those of you that are wondering, I won’t be leaving the print in front of the fireplace in the winter when we actually use the fireplace. I wanted a pretty screen, but never could find one that I liked that was the right size. So just remember, just because it hasn’t been done before is not a reason not to try it. And although I haven’t seen this done before, I suspect someone somewhere has done it. I”m sorry….I like the open feeling of a fireplace. The picture, chairs, flowers, just makes the whole area too “busy”. It just looks like too much is going on. But thats just my opinion. You have such nice fluted moldings, and it’s just lost, with your other decorations. Terrie, I have to agree! I don’t like clutter, and after I took the photos, I removed much of what you see. And now I have a fireplace screen and like the look without the chairs. Well I like to try different looks. Thanks for the feedback! 🙂 great minds… last year I had one of my horse canvasses hanging in front of the fireplace. I think it’s a wonderful idea. Luv your piece of art! I agree… try new things. Do whatever makes you smile. I like the frame alone, without the art, in front of the fireplace! i wish i had an opening like yours, but have glass doors instead. You are inspiring me to place something in front of my fireplace to eliminate the “black hole”….. what a fantastic idea!…and love the Paris map! I like the map because the colors blend in well with the other colors in the room. 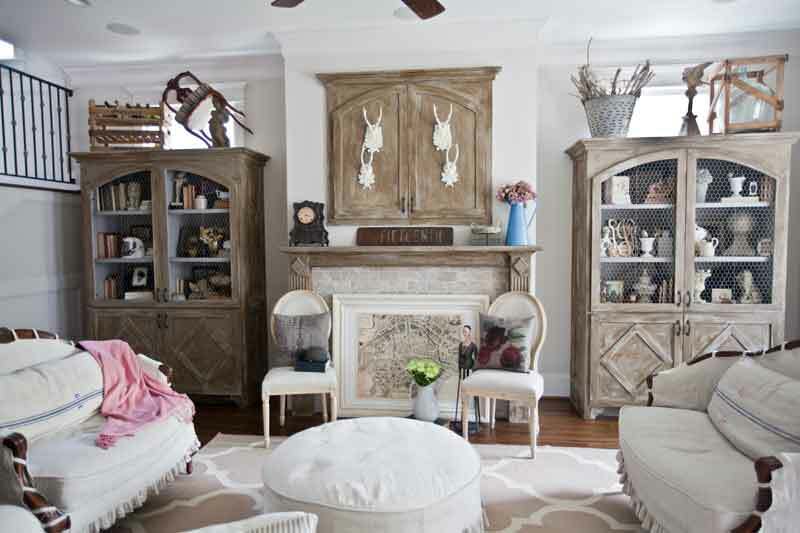 It is a great way to display something that you might not have had the opportunity to display– if even for a short time when the fireplace was not in use! Brilliant and beautiful idea, Anita!!! 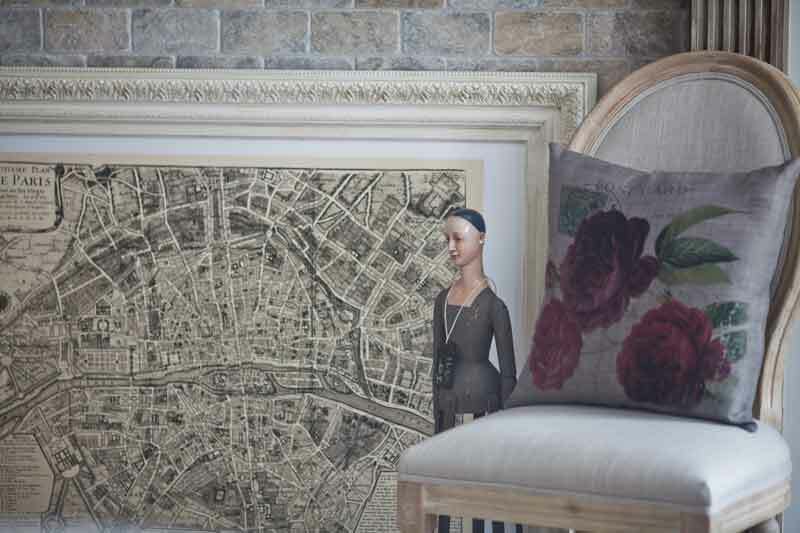 I love the map and it works perfectly with your french country home! Great idea to lean the framed map against the fireplace. 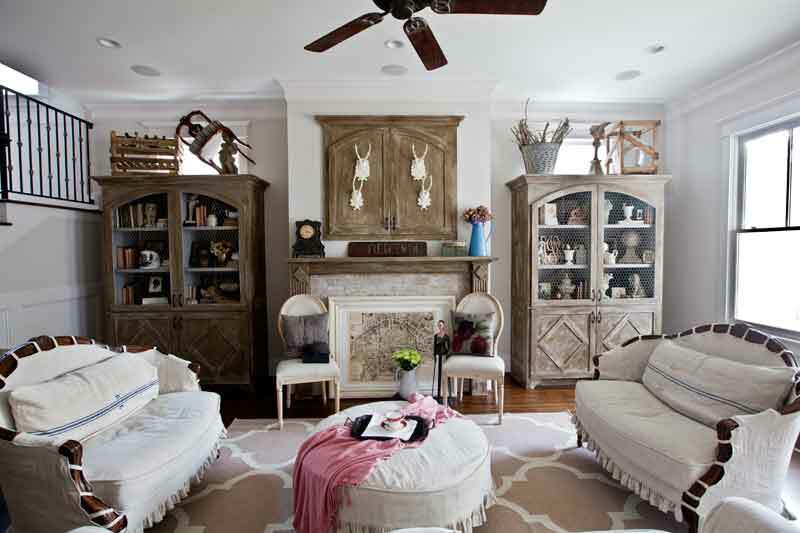 It really is a perfect piece because it is not too colorful so it blends well with the rest of your furnishings. I agree with those who are not a fan of the black hole. Only problem for me is that I have an equally large painting, with glass, above the gaping hole leaning on the mantle. Actually it is hanging but made to look as if it is leaning. So I am still looking for the perfect fix. Would love to see photo of updated version with the screen and chairs removed. As always, thank you for these inspiring posts. What a great idea, especially for covering a fireplace in the summer. I have a large mirror above my fireplace so cannot hang art, this is another option.